By far these are the best cookies I have ever baked. These have almost a melting in the mouth texture. Especially, when eaten all dressed up with a heavy shower of castor sugar and sandwiched with jam…these are simply ittesistible. If the pictures don’t testify the taste I will appeal you to make a small batch (which I promise you will regret later) to see it yourself. Baking in India is not very easy, and I guess all bloggers residing in India , serious in baking, will agree with me. Starting from a mere necessity like muffin liners to very little known ……paper you don’t get things easily even in big cities like Bangalore. I have drooled and drooled and almost turned green with envy every time saw bloggers baking good breads (everyone will tastify especially Aipi)…now that I have found the perfect instant yeast (all thanks to Suma) I am in constant fear that what will I do if they stop stocking this specific brand. So when saw this Linzer cookies recipe in Good House Keeping, I instantly fell in love with these but was not sure where to find hazelnut…so like every time I again tried to replace it. This time with the huge stock of Almonds I had after Diwali. Soon I was roasting the almonds and measuring flour. Making of the cookies are easy if you roll the dough between two sheets of plastic wrap. 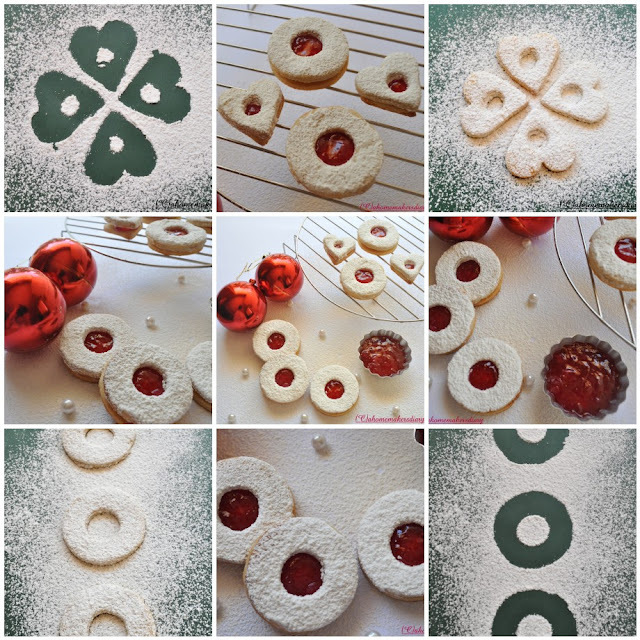 Linzer cookies are cut with special cookie cutters specially made for this. I dint have any so again used 2 big and small bottle caps for the round ones (oops! now Hubby will know why the medicine bottle cap was missing for a couple of days) and a small heart shape cookie cutter for the smaller ones. Loved making every minute of it as these were my first sandwiched cookies but what made me content is my baby’s love for it. This morning when I finished clicking suddenly he woke up and came to the room. He looked at the cookies and exclaimed “Bi Bi (biscuits)’’…I handed him one. He first licked the top coat of sugar and with a happy face declared “bhayo (bhalo or good)”, then he opened the top cookie and with his finger ate all the jam. Once the jam was finished he came to me demanding “abar abar (that literally means again but he says this also to mean some more). I loved every moment of it. Watching our kids grow is the most wonderful experience of life, and when they appreciate the the food we cook, thats the best reward. Take the almond in a micro proof bowl and cover with water. Microwave for 2-3 minutes. Take out, rinse with cold water. Drain all the water and spread on a newspaper. Press almond between your finger the skin will come off easily. Now dry roast the almonds in a skillet till it release a nice nutty aroma. Take off and let it completely before doing anything with it. Grind the nuts with the sugar to a very fine dust texture. Do it by pulsing several times and make sure the nuts don’t release oil. Sieve the flour, baking powder, cinnamon powder and salt. Keep aside. Now with n nelectric mixer or a spatula cream the butter, add the sugar-nut mixture and cream once again. To this add the egg and vanilla. Mix well. Tip in the flour-baking powder mixture in two batches, combing well after every addition. Make a sticky dough. Divide it in two equal part, cover with plastic wrap and pat to make a 1/2" thick disk. Chill for 30 minutes. Once you are ready to bake preheat the oven at 175 C.
Roll one dough between two sheets of plastic wrap to ¼” thickness. Cut with cookie cutters or bottle caps. Repeat till all the dough is finished. Place them on a greased cookie tray and bake for 12-14 minutes or till the sides turn a little golden brown. Before serving dust the top cookie with generous shower of castor sugar, and put jam on the bottom one. Sandwich and serve. Make sure you cut a pair of cookies for the finished one. One cookie with a cut out at the center and the other whole. You can alternatively pulse the almond with ¼ cup flour as well. Put jam only when you want to serve it or it will become soft. So what did you bake this year for Christmas??? almond flour, almond meal, almond cookies, hazelnut flour, walnut flour, what to cook with almonds, best almond cookies recipe, best almond recipe, best cookies recipe, Christmas cookies, cookies for christmas tree, snowfall cookies, jam cookies, sandwich cookies, European cookies, linzer tart, austrian cookies, raspberry jam, jam sandwiched cookies, melting cookies, best cookie ever, gourmet cookies, white cookies, eggs in cookies, perfect linzer cookie recipe. Prefect and elegant linzer cookies, u have done tremendously dear..
Wowww wat a fantastic, prefect and drool worthy coookies.. The cookies a stunners Sayantani! the cookies look super cute and delish! wonderful job! Loved your little guy's reaction! Cookies look so perfect . Love the look of it. Wow..Sayantani..Its a feast for the eyes..Awesome pictures..Seems like you had a lot of fun with these clicks..The Cookies look remarkable..and just so gorgeous...Send me some.. Thanks everyone for all your good words. @Spice, thanks a ton dear. the kantha work purses that I sent for arusuvai is not made by me, rather they re from our workshop. thanks for the complement though. I second you on the difficulty in getting baking gear in India! These cookie are real treats.Yours have come out beautifully! These cookies do look gorgeous, with perfect center and shape. Beautiful clicks, Sayamtini. Happy holidays. Beautifully made cookies, real feast to the eyes and tummy! Have a great weekend and Happy new Year..
You wont believe it...but I was talking to my hubby that you do so much of baking in Bangalore, where as when I was in Pune...I could hardly find stuff around!!!! Hats off to you!! Dont lose heart and keep up the good work. This cookies have turned out to real beauties!!! Amazing! !Linzer cookies at home???Superb! !Happy Holidays to you!! They look so pretty! Wishing you and your family merry christmas and Happy New year. Cookies look awesome!Pictures look so lovely. But u ve done an awesome job with the cookies with any special cutter! Merry Xmas to u and ur family! Cookies looks tempting and I cannot resist myself. Wonderful presentation. Hi Sayantani,great to visit your blog!You have a collection of some wonderful recipes...good job! Awesome cookies ! Am sure they tasted as fantastic as they look! And ask me about baking problems in our country.. sigh!! Very good pics I must say, love to have these for my event, thank u! I loved these cookies too :-) It looks so wonderful. have a wonderful year Sayantani. Wishing you that the new year brings you joy, warmth and everything that desire.